Contact PR [at] immedium.com with any enquiries. "...a lavishly illustrated childrens' book...I'm considering making friends with people who have kids, just so I have an excuse to buy, like, a zillion copies." "Critter lovers, young and old alike, will fall in love with Meomi's new book series... The colorful tale features 36 pages of vibrant and sophisticated images including four murals that bring this underwater world to life. Be sure to look out for critters speaking in a range of languages representative of the different parts of the world and Wong's favorite sea unicorns ‹ Arctic Narwhals!" "Another valuable lesson the book makes is that of critical reading: the digitally created cartoons are great fun, the gang of friendly pets brims with energy, the text is full of wit." 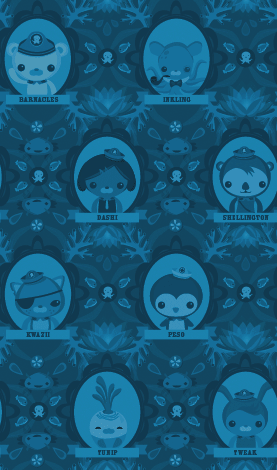 "The stunning, stylized color illustrations emphasizing simplicity, curves, and a "big head/small eye" anthropomorphic look gives Octonauts a unique appearance, while the story tells of their encounter with a lonely sea monster leading to an important lesson about the values of friendship and individuality. A wonderfully imaginative and enchanting tale." "The characters are cuddly and quirky, and the moral of the story is as good as a hug from a dear one saying `I love you for the individual you are.' We hope that's a joy you'll never outgrow." "Helloooo, how can you resist a story of adventure with cute animals? I love their travels around the world especially into Japan. The illustrations just draw you in and this book is a perfect holiday gift for the kids or the kid in you!" "The characters are engaged in exciting adventures throughout the world and display characteristics to which young children can relate ­ seeking adventure, seeing the value in ordinary life, using technology, and appreciating one's friends." "With a burgeoning roster of sassy and adorable characters, beautifully realized illustrations, and a heap of wit and imagination, Meomi is poised to emerge as a new empire of cuteness!" "There are also more Octonaut adventures to come (hopefully one in October 2007), and I for one cannot wait to read them. I think these will quickly become favorites in your household as they have fun characters and show such an adventurous and stunning world under the sea that one cannot help but want to learn more about." "The book looks very attractive." "Meomi.com seriously delivers on cute characters." "My interest in Meomi is from a fine arts/design aspect. The fact that my kids went nuts over their imagery and characters, placed my family on the same page!" "If you could taste Meomi, it would taste like strawberries and sherbet!" "One world, "Kawaii!" That's what everyone will say when they see the sweet world of Meomi!" "We love the illustrations from Meomi's new book The Octonauts!" "While it appears as a deceptively cute children's book, possibly spun off of a small indie collection of vinyl toys, it turns outŠ to possess the power to destroy the universe if it's not handled properly ...it looks great, with super-cool, beautiful illustrations." "My mouth is watering just seeing samples of this book! ...absolutely delicious artwork." "...we can't get enough of their illustrations and highly recommend this 36 page sea thriller for your kids."